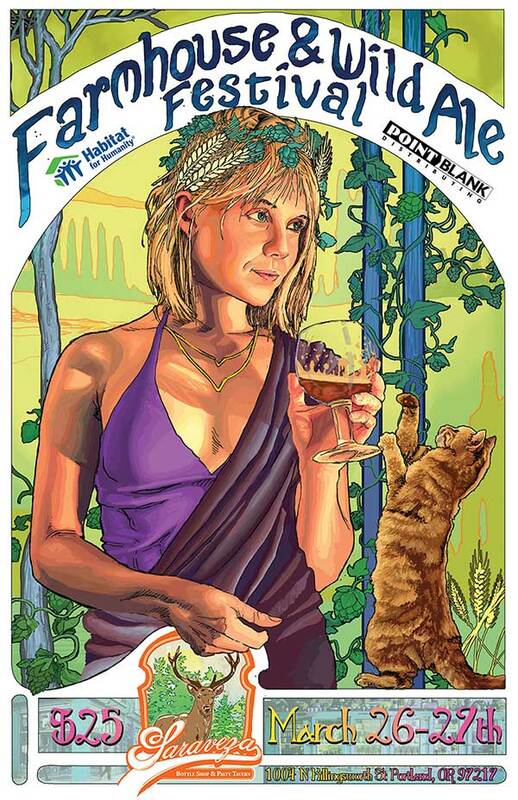 The 4th annual Portland Farmhouse & Wild Ale Festival takes place Saturday and Sunday, 26-27 March 2016, at Saraveza (1004 N. Killingsworth). As spring blossoms and the weather milds the Portland Farmhouse and Wild Ale Festival falls back to Saraveza, Bad Habit Room and side street of N. Michigan for it’s 4th year. Oregon’s largest and perhaps the Pacific Northwest’s largest Farmhouse dedicated beer festival continues to highlight American made wild and rustic ales that take their inspiration from the beers of France and Belgium. This year the Portland Farmhouse and Wild Ale Festival introduces a new VIP early entrance and an exclusive bottle and draft release called ‘The Croze’ from The Commons Brewery. Over 60 beers from over 25 breweries will be available over the weekend. Participating breweries include: De Garde, Jester King, Block 15 Brewing, Sante Adairius, The Ale Apothecary, Perennial Artisan Ales, Crooked Stave, The Commons, Upright Brewing, pFriem Family Brewers, The Bruery, Solera Brewery, Logsdon Farmhouse Ales, Great Notion Brewing, Propolis, Agrarian Ales, Three Magnets Brewing, Stillwater Artisan Ales, Hair of the Dog, Almanac, Breakside, Culmination, Russian River, Blackberry Farms, Urban Family Brewing and Golden Valley. Tickets are available in advance or at the door for $25, which includes 10 drink tickets and a collectible glass. 4oz pours are 1-4 tickets. Visit Saraveza’s event posting for more details, including a special VIP session option. $1 from every admission will be donated to Habitat for Humanity, Portland.